Barnaby Joyce: fighting for what’s fair and right. Australia’s maniacal obsession with attempting to power itself on sunshine and breezes has led to ‘The Great Shame’: a 140% increase in the number of homes disconnected from the grid, no longer able to afford power prices rocketing, year-on year, at 16 to 20%, leaving 25% of households unable to cool their homes in summer heatwaves or to heat them during the depth of winter. The idea that a resource rich country like Australia has tens of thousands of people no longer able to afford power is outrageous. 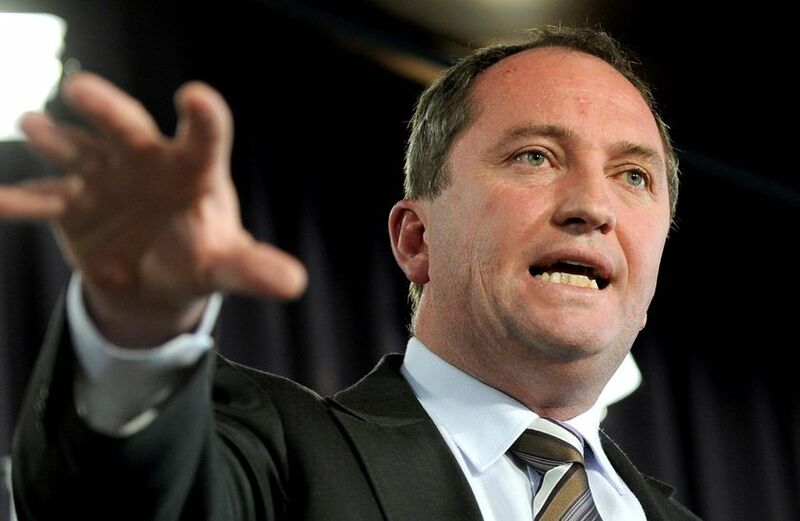 One character who shares STT’s sense of indignation is former Deputy PM, Barnaby Joyce. Barnaby may be one of Australia’s more colourful politicians, but for all the controversy his personal faults attract, his heart is clearly in the right place. What kind of society switches off the lives of its poorest people? There is something morally wrong when a widower cannot pay an electricity bill in a nation that once boasted the cheapest power in the Western world but now delivers the most expensive, despite the $30 billion taxpayers have invested in renewables. This is a person who has never asked for favours, and in many cases does not nominate for access to hardship programs — but their children may come home to a house without power. The hardship program, even if you can wait to get on it, does not write off the bill. It assumes you can afford the payment plan. If you do not pay it’s listed as a bad debt on your credit record. This may haunt you for years. For the family there is the humil­iation and hardship that you live in a house without a fridge, without an electric stove, without a washing machine, without a toaster. No television, no hot water, no electric lights. On the ABC’s Insiders last Sunday, political journalist Malcolm Farr scoffed about “electricity as a human rights issue”. We have become so cynical about the most vulnerable. They are an acceptable casualty in our quest to “do our part” to cool the planet, even though our action achieves nothing away from worship of parliament’s boarding-school zeitgeist. Labor has shown complete ignorance of the almost 128,000 households that have been disconnected and those living in poverty as a result. It now says their car is politically incorrect and must be electric to be charged from a source they don’t have, with money they don’t have. Labor has arrived at the inner-suburban wealth of the 2020s while leaving the roots and compassion of its heritage far behind. Instead it complies with the edicts of Australia’s wealthiest constituency, the Greens. Where do a great number of those who cannot afford power live? They live in the left-behind towns and villages that orbit our major regional centres. They live in a humble house and have made the decision that groceries trump power bills. They live where there is no public transport and a second-hand car is the only transport from home to town, where the store, doctor or chemist is. Why is Australia so blind to this national disgrace? Why is the Labor Party so beholden to a stratum of society that is so removed from the leaden monkey that sits on the back of those at the bottom of the social stack? In the regional towns on the back of drought and a new world of internet purchases, small business can no longer afford the power bill, nor can services or small industry, and big businesses are forced to take their production overseas. Electricity is the food stock of the standard of living and the effects of exorbitant prices compound in regional areas and undermine any chance of relief in the cost of living. I do not believe coal is a holy rock that will save humanity, but it is the source of power for so many in our Southeast Asian region who face a similar dilemma of power costs. Many confront it with our coal that travels in giant trains that snake through the towns and vil­lages where our people live in a poverty of unaffordable electricity. Those who live without power or who cannot afford today’s prices cannot wait for promises of cheaper, renewable power. To them it is a cruel hoax. Theories are debunked by their reality. People who cannot pay their power bills now, and who remember paying more affordable power prices in the past, are understandably cynical about the renewable power plan. We export uranium, which becomes acceptable only after it has crossed oceans on its way to power stations in other countries. Nuclear power with zero carbon emissions — isn’t this what we want? Market exploitation of those who cannot pay their power bills remains as Labor and others did not support divestiture powers that could have been used to threaten major power companies into fair conduct towards customers. State poles-and-wire costs are exorbitant. Even talking about the issue of power is proscribed. It will break the “truce”. But what truce is there for the person living in privation? Why would you settle to stay in the misery you are in? What truce is there if their standard of living is being placed beyond their capacity to pay for it? Relaying the truth of the situation of those who cannot pay their power bill will come at a price of rebuke by those who believe all reference to the nation’s biggest income earner is anathema. Who represents those without power when this is the Greens’ agenda and Labor relies on the Greens? Who represents them when inner suburbs have the idle income to cover increased power prices and renewable subsidies to install solar panels on their own inner-city house? The Nationals are the only hope in fighting if not for common sense, then at least for justice. If you care about Australia don’t vote for Labor or the Greens in the coming election. Also, pressure the Liberals to give us safe reliable and cheap power for all… there is no reason we should not have this as a basic right in such a wealthy country as ours. At present Australia is not the Lucky Country but more the Nutty Country? Our currency would most probably collapse if we stopped selling coal and uranium overseas for ethical reasons so we won’t stop selling it. Other countries happily use our coal and our uranium for energy while we close our coal fired power stations to pander to the lefty greeny idealists who want us to rely on wind and sun and other expensive or unreliable sources for our power. They would have us swelter (when power outages happen in Summer), freeze (when power outages happen in Winter) or turn off the power altogether if we cannot afford to pay the bill as power costs soar. Our collective standard of living is suffering from this madness of avoiding the realisation that we need coal fired power stations to give us reliable power. Access to power is a human right since our homes are constructed to use power to provide us with basic needs such as hot water, cooking appliances and heating and cooling. No Australian should be deprived of power for heating, cooling, hot water and cooking nor should people be forced into asking for food aid because of high power bills!!! It is interesting that Barnaby Joyce, like other politicians, doesn’t seem to know that it is the RET that is at fault, not the retailers whom they wish to punish. I guess that the retailers are an easy target! His crocodile tears should be put aside and he should attack the RET, try to have it rescinded. That might do some good. While they will not even mention the real culprit no improvement will occur, can occur. Seems greenys not worried about the poor trees anymore. Great fire risk when it comes out of trees should make it to melbourne. Federal member for Wannon, Dan Tehan MP has announced funding for the Portland to Nelson Rd. The timing is interesting. I wonder if this might have something to do with it? GLENELG Shire’s bid to be the renewable energy capital of Australia has had a huge boost with plans for a massive and unique wind farm project between Portland and Nelson. The $1 billion Kentbruck Green Power Hub, a 900MW wind farm and battery storage facility, is being proposed by Neoen Australia and would involve wind towers spread over 30km of actively managed and harvested pine forest. If the project goes ahead, it would be the fifth-largest wind farm in the world, and the towers – the number of which has yet to be determined – would be built in the forest. It would also include a battery storage facility similar to the existing one operated by Neoen, the world’s largest lithium-ion battery built by Tesla at Hornsdale in South Australia, though the exact technology for Kentbruck would be determined through a competitive tender process. Neoen, which is headquartered in France, is one of the world’s largest renewable energy companies and says it is the largest independent producer in several countries, including Australia and France. A $1 billion wind farm and battery storage facility will be built near Portland under plans revealed this week. The proposed 900MW facility will be the largest and one of the first energy projects in Australia to be located within an actively managed and harvested pine forest. The Neoen project is the first of its kind in Australia and will be located mainly in pine plantation owned by Mount Gambier plantation company GTFP. Kentbruck Green Power Hub covers 30 kilometers between Portland and Nelson. Neoen Australia managing director Franck Woitiez said that while the project was still in the early stages, the company was keen to open dialogue with the community on the proposed development so that any concerns could be addressed early on. “All our projects aim to protect, retain and restore natural resources and the environment,” Mr Woitiez said. GTFP’s managing director Laurie Hein said the company was pleased to be working with Neoen on its proposed project at Kentbruck. “We believe it will benefit the local community and provide clean, renewable energy on a national scale,” Mr Hein said. “It’s unique in so much as … there’s nothing in the country at all where you’ve got wind towers in amongst a commercial tree farm. Neoen has developed and operate large-scale renewable energy projects in Australia, including the world’s largest lithium-ion battery in Hornsdale in South Australia and the country’s largest fully operational photovoltaic facility in Coleambally in New South Wales. Further details on the numbers of turbines being considered for the project are yet to be finalised. If the proposal wins approval, construction could be under way by 2021. Neoen will host public information sessions at Nelson CFA hall on April 15 between 2-7pm and at the Portland Civic Hall between 2-7pm on April 16. The public drop-in sessions follow initial consultations with neighbours and the local council and serve to inform the community on the assessment process and to receive feedback on the project. The announcement comes after the news that a $875 million wind farm at Hexham is in the pipeline. That project by company Wind Prospect is in the early stages and is expected to generate up to 700MW of power from up to 125 turbines. If successful, the project would being construction by 2022 with turbines as tall as 250 metres. What next, so another beautiful area of SW Victoria is going to be destroyed and if they get to build this one what next – another part of the forest. If people living in the area proposed are foolish enough to fall for the talk we can expect the whole of the SW Victoria and encroachment into SA, even though proposals here have already been stopped they will continue to push until they get what they want – MONEY MONEY MONEY, and the death of this Nations environment. People living near the border on the SA side been to be notified so they can go to the meetings and see exactly what is proposed – they may want to sell up quickly to get away from the horrendous noise. This development proposal presents a clear and obvious risk Jackie. A large blaze at a pine plantation at Kentbruck in Victoria’s far south-west has jumped a containment line. The fire has burned through nearly 3,000 hectares of plantation and national park between Nelson and Portland since Friday. Crews are relying heavily on water-bombing aircraft because ground equipment cannot be used in the boggy terrain. But the Country Fire Authority says it is still not posing a threat to lives or property. Nearby, a watch and act warning has been issued for the communities of Drik Drik, Greenwald and Winnap after a small bushfire broke out north of the Kentbruck bushfire. The fire is expected to impact the towns any time in coming hours and residents are being advised to follow their bushfire survival plans. The Winnap-Nelson Road has been closed. As a toddler, I did not recognize this mostly because in dose days we built hydro in Sweden. Later we built nuclear to really get fossil-free electricity which we did and on top of that, we have not increased the use of electricity during the last ten years although we have increased the population by roughly 10%. Now we are exporting almost 20% of the production and that is the double of all electrical energy from wind. Still, the establishment is focussing to build more wind et. al. in order to close down nuclear, not for that it´s cheaper (double LCC compared to nuclear not taking into account the back up that is needed), or for that, it´s dangerous on the contrary really coal and indoor fires kills millions every year while nuclear radiation has perhaps killed a couple of hundreds during the more than 50 years.